Not all sewing is about the great or the glamorous. I will admit, a lot of my projects make it to reality just because I think they're 'fun' but of course there has to be a fair amount of simple, useful stuff as well. Case in point? I could use a simple not-black t-shirt-y top. And I made it. For the pattern, I 'cloned' a top I already owned, which was in its turn refashioned from a much larger top I had been given (I had kept the neckline and shoulders and just taken in the side seams. Because front and back are the same, tracing it was ridiculously easy). For this version, I bound the neckline with wide strips of the same fabric which I sewed to points for center front and back first and then serged on. It's a bright colour for me, but I think it will work. 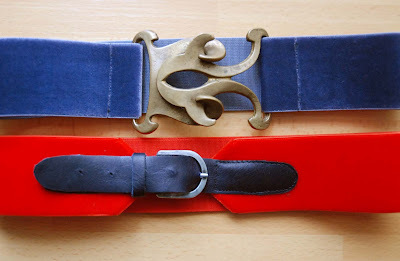 In other small sewing news, I decided to turn my attention to belts. I seem to have collected quite a few garments which look best when worn with a belt, but I only ever wear one. A black elastic belt which I bought from H&M two years ago. Of course, I know 1950's style dresses should be worn with fairly skinny self-fabric belts but on me, I like the look of a wider, contrasting belt better. And of course, I know one can make belts. I have at least 10 buckles in my stash, including a fancy cover-your-own one. Oh, and I've have two meters of coloured elastic velvet ribbon in my stash for about a year. This weekend, I finally put some of those supplies to use. Grey velvet elastic ribbon with a huge brass buckle (I once bought a very ugly old belt at the second hand market stall for 0.50 euro to get this thing) and red velvet elastic ribbon with black leather straps (cut from thick leather) and a little buckle (also from an old belt, I think this buckle came from a belt my grandmother gave me). And this is how they could be worn (sorry about the dark pictures, the weather didn't cooperate). I love the belts. I have some wide elastic and several (more than several) belt buckles I want to bring together, but have yet to do it. I love them, especially the buckle of the top one! I agree, the wider belt look is really great on you. I wish I could wear cinching belts... the look never seems to agree with me. Those belts are really amazing. The red! Zing! Gorgeous buckles... I keep looking for nice vintage ones because I love belts on summer dresses and always in need of a few. any? Kindly allow me recognize so that I could subscribe. Thanks to my father who shared with me about this weblog, this weblog is in fact remarkable.